Hiring Masonry Contractors - Brick Restoration, Inc. If you’ve searched for home improvement contractors, you will find that there are many to choose from but will soon realize that finding the right masonry contractor can be stressful. Like other industries, there are always those who picked up the trade as a hobby that eventually became a “business. The reality is that a huge portion of masonry contractors are 1-2 man operations. These are one man operations that you have probably encountered. The listing is for a reputable sounding contractor company but when you call the number, the boss himself answers the phone (or maybe he doesn’t) while on site somewhere. The listing is for a reputable sounding contractor company but when you call the number, the boss himself answers the phone (or maybe he doesn’t) while on site somewhere. You can tell he’s on site because of the background noise and the usual lack of formality and process for scheduling an appointment. While we completely endorse the entrepreneurial spirit, with this business model, the customers always suffer as the one person is having to wear all of the hats that come with running a business. Our customers tell us these stories where they made a verbal appointment with a masonry contractor “company” and that they failed to show up at the agreed upon time and when the customer calls, the contractor says that they forgot and/or something came up. No heads up, no text, no nothing. When hiring a company to take care of your most valuable assets, it’s important to take into account all of these things. Especially in the scenario that something goes south. You want to be sure that you can call a brick and mortar location and have a human representative there to handle any issues that may arise. Even if it’s simply servicing a warranty claim. You get what you pay for and that rings true for when hiring a service company. What we’ve found is that many contractors prefer to give a single, “bottom line” price for the job or project. This might seem nice, but it completely leaves you in the dark as far as how much the contractor is charging for each aspect of the job, including materials. For example, let’s say you originally wanted to have a brick paver walkway branch off to another area of your patio, but then you decide against it. Without an itemized bid, you have no way of knowing how much you should be credited for that eliminated work. Having these items laid out makes it much easier to not only compare different contractors’ bids but to plan accordingly and cut specific project costs if needed. Also, an itemized bid is great documentation to have regarding all of the aspects of the project. Especially if there are any disputes down the road, you’ll be glad you had this itemized bid. With that being said, it’s definitely a red flag if a contractor gives you a hard time about itemizing their bid. 2. Is your bid a fixed price or an estimate? Every contractor works differently, and there’s no problem with that, but it’s important to be aware of how they work. When it comes to bids, some contractors do in fact treat their bids as estimates. This means that the final bill could wind up being much higher when the project is complete. This is why you must ask if their bid is an estimate and if so, can they provide a fixed price bid instead. The only reason that a reputable contractor would not be able to offer a fixed price would be due to there being too many unknown variables about the project. If you can’t solve the unknowns, then have the contractor write a fixed bid only on what he expects to do. If additional work is needed, you can always do a change order, which is a written mini -bid for additional work. 3. How long have you been doing business here in town? You want a contractor that has worked locally for at least a few years. This ensures that they have an established network in the area and a local reputation to uphold. Choosing an experienced and reputable local contractor is a much safer bet than choosing a contractor who’s either new to the business or planning on commuting to your job from 50 miles away. A business card — make sure it has a nearby address and not a PO box. 4. What is the specifics of your business insurance? A lot of contractors throw around the word bonded and insured but often times they really have no clue about the specifics of their coverage, or they just buy the minimum to be able to say that they are insured. Bonding protects the consumer if the contractor fails to complete a job, doesn’t pay for permits, or fails to meet other financial obligations, such as paying for supplies or subcontractors or covering damage that workers cause to your property. Always confirm bonding by asking for a certification and contact number. There are two common types of contractors insurance: liability insurance and workers’ compensation. Liability insurance covers such situations as contractor-caused damage to your property, although it doesn’t typically pay for repairing or replacing shoddy work. That’s the reason for the bond. Workers’ compensation provides payment to injured workers for lost wages and medical services, regardless of who was at fault. The coverage will also provide benefits to the contractor’s family in the event of a work-related death. Making sure a company is appropriately insured is equally important to ensuring that you’ll be satisfied with your project for years to come. Ask the contractor for certificates of insurance and check to make sure the policies are current. Brick Restoration is bonded and insured with $2 million in General Liability & Workman’s Comp. 5. Do you subcontract your work? A lot of general contractors have a dirty little secret that they really don’t want you to know. The secret is that they are gonna sub-contract out some, if not most aspects of the job and pocket a good portion of money for someone else doing the work. Essentially these types of contractors focus on signing clients, managing budgets and scheduling sub-contractors. Always ask if they’ll be hiring sub-contractors and if so, ask for specifics on which aspects will be subcontracted out. You should also ask how involved the general contractor will be with the project. Then you want to make sure they hold up their end of the bargain and are present on the job site as often as they said they would be. This is crucial for quality assurance purposes, as we’ve heard many horror stories of shoddy work from unsupervised sub-contractors. In case you’re wondering, Brick Restoration NEVER subcontracts. We believe in investing in specialty training for our employees. 6. Do you offer a warranty in writing? A warranty is only as good as the paper it’s written on and the company that wrote it. Some contractors might say anything to get the job, including a “lifetime” warranty aka “call me anytime”. It’s important to realize that these warranties are usually hardly enforceable unless the contractor is a legitimate company where you can escalate the issue. Otherwise, good luck getting a warranty claim serviced if your contractor won’t answer their cell phone. Brick Restoration provides a 1-year full warranty on all of our work, and you can rest assured we’ll be around to service any warranty work you may need in the years to come. Now it’s time to do your homework if you haven’t already of course. ThisOldHouse.com also wrote a great article on how to choose a contractor for your next project. We are the highest rated full-service masonry repair and installation contractor serving the Greater Houston and surrounding areas. Known for our expert workmanship and outstanding results, our extensively trained masons and patented technology separates us from other masonry contractors. Schedule your free estimate today to meet with one of our Restoration Specialists. I forgot to ask that if anybody has any really good questions to add, please comment here and tell me! I want this list to be an awesome cheat sheet for property owners when vetting contractors! We’ve heard too many horror stories and just want to help. I’ve had contractors say all the right things but when it came down to it, they were too busy and couldn’t manage their schedules. Just my 2 cents but great article! Julio, that’s a great question! A definite “must-ask” when interviewing independent contractors or very small outfits. I do think the question could be adjusted when looking at more established companies, like ourselves here at Brick Restoration, Inc. When interviewing an actual company, I think a variation of that question could be: How many jobs does your company complete per week, month or year? This way you can get an idea of how much work they are really putting out and surprisingly the quality of the work and the satisfaction rating of their customers. For example, if company A does 1000 jobs per year but only has 3 reviews on Google, and company B does 500 jobs a year but has 19 reviews on Google. That could be a GREAT indicator of how happy you’ll be with them after the job is said and done. Thanks again for the great question Julio! We’re gonna put in as an “Honorable Mention”! I like that you mentioned asking for a business card. This is a good way to check professionalism. You can also visit the physical location and make sure they have the staff to get your job done. Thanks for your input Kenneth! We agree with visiting the company’s brick and mortar location. We are always encouraging our customers to come and visit us so they can see that we’re equipt with all the personnel, fleet, tools and materials to do a job well done. 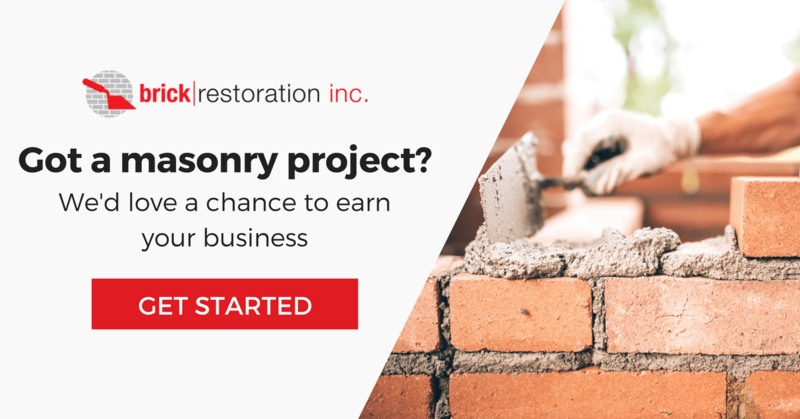 I agree that you would want to find someone who is properly experienced to help you with your brick restoration project. I would imagine that you would want to find out how long they have been doing business locally because this could be a measure of experience. My husband and I need a masonry contractor to help us out so we’ll be sure to find someone who has been doing business in town for awhile. We agree with you Olivia! Knowing the reputation a company holds locally is a huge indicator of what you can expect when doing business with them. It’s also good to consider that some companies with multiple locations may not always preform the same at each one. Thank you for your input, we hope you gained some good value for your upcoming projects.